The Young Clementina by D.E. Stevenson ~ 1935. Original/alternate titles: Divorced From Reality and Miss Dean’s Dilemma. This edition: ACE, 1975. Paperback: 0-441-95048-5. 320 pages. Completely met expectations, up to and including the blush-inducing ending, which lost the story its single “you’ve got to be kidding!” point. Golly, D.E. Stevenson often bobbles in those last few pages, doesn’t she?! Well, really, the ending’s not that bad. Just…hmm…maybe just a little bit rushed? And a little too good to be true? But hey! – that’s why I’ve come to quite adore D.E. Stevenson. This story in particular is escape literature at its delicious, romantic, improbable, suspend-your-disbelief for hundreds of pages, period-piece-vintage best. Okay, here’s a brief overview of the set-up of this novel. It’s very nicely done indeed; one of the author’s melodramatic (versus her more placid and thoughtful) minor masterpieces. I wonder how a hermit would feel if he had spent twelve years in his cell and were called back to the world to take up the burden of life with its griefs and worries and fears; if he had passed through the fire of rebellion and achieved resignation; if his flesh had been purged by sleepless nights and his mind had found the anodyne of daily work. Would he feel afraid of the world, afraid of the pain awaiting him, afraid of his own inadequacy to deal with his fellow men after his long, long years of solitude? Would he refuse to listen when the world called, when his conscience whispered that his duty lay outside his cell, or would he gird up his loins and go forth, somewhat reluctantly, into the world which had turned its back upon him for twelve years? Our narrator is middle-aged Charlotte Dean, inhabitor of a dreary London flat, efficient and self-effacing librarian at a quiet geographical library – repository of “any book that adds to the geographical knowledge of the world” – recluse from that very world. Her only friend, aside from her kind employer, Mr. Wentworth, and her dedicated charwoman, Mrs. Cope, is her diary, in which she records her daily doings as she has done from childhood. The Great War tore Garth away from Hinkleton, and upon his return it is, unexpectedly, Kitty who becomes the new lady of the Manor, while Charlotte remains at home to care for her failing father, and then creeps off to London when his death leaves her alone and penniless. For some strange reason Charlotte and Kitty are no longer the close friends that they were in childhood, and Garth openly sneers at his once-beloved “Char”. She meets them only occasionally, and so is rather surprised to be asked to act as godmother to her young niece Clementina – named after her vivacious mother – and to visit at Hinkleton Manor for the occasion. But Garth is still dismissive and sarcastic, and Kitty disturbingly self-centered and complaining, so Charlotte returns to her quiet life with no thought but to regain her hard-won peace of mind, and to leave the dead past buried. For another look at the story, and an enthusiastic recommendation, a visit to Fleur Fisher‘s review will be in order. I can see why this novel is so highly thought of by D.E. Stevenson devotees; she’s in fine form throughout. I do believe this one has just been re-released on July 2, 2013, so it should be readily available, just in time for your summer reading pleasure. Here’s the Amazon.com link, which includes an excerpt of the first chapter. And I’ll say once more, this is a very vintage romance, written in the 1930s, with all of the expected clichés. It is, perhaps, even a bit old-fashioned for its time; it rather reads like something out of the closing years of the century before. With that in mind, enjoy! I’ve got a library hold on this right now and have been excited to see other bloggers reviewing it since the reprint came out – for once, you and I are not the only ones reading D.E.S.! Can’t wait to read this and see what I think of it, though I am glad of your warning about the sloppy ending. Why could she not get those endings right? Why!?!? 🙂 I know! Everything’s going along beautifully and then it’s like she just realizes she only has a bit of paper left, or maybe her pen’s running out of ink, and she cobbles together herendingallinahurry and you’re sitting there at the end of the last sentence going ????? But it’s kind of funny, too, and I like her stuff despite that annoyance. Occasionally she hits it okay. For example… hang on … can’t think of any titles where she nailed it … maybe Amberwell? I quite like a sudden ending, and I rather hoped that this one was laying the path for a sequel, taking up Clementina’s story. but it seems not. If I did points the handling of the imaginary friend situation would have knocked one off. Much too contrived for my taste. And I agree on the imaginary friend. I had a suspicion early on that she would materialize, and by golly, there she was! Ah well, if we want to pick any of D.E.S.’s stories apart there’s much there to keep us busy! 😉 But I must confess I am turning into quite a fan, and the bits I criticize are so easy to brush over! Oh I am sooo glad to see this review and another D.E. Stevenson fan! 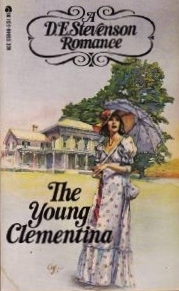 “The Young Clementina” is a book I have read and re-read often throughout the years. I was also pretty excited to see some of her novels being re-issued.